It was so nice to have this couple here. They are my son’s friend’s grandparents and every morning, Kai drops off to the house to pick up her, then go together. This sushi class is a lovely gesture from her mum. She would like to say thanks to them to look after her kids. I am so delighted to arrange this class. Originally they are from Scotland and very friendly. I have heard that her grand dad is a bee keeper. Yes! keeping bee to collect honey. Of course I know what bee keepers are doing but I didn’t think that I would meet a bee keeper in my life. I was so curious about this specialist. I may asked a lot of question about what and how he is doing. So much talk and laugh. They seemed a lot of surprise about Japanese ingredients as they are not familiar with foreign food. I was not sure how much they eat unknown dish. But they kept saying “delicious” and “lovely”. Many thanks both of you. It was great fun to have cookery class today. It is a lovely birthday present idea, isn’t it? My friend also a barista who makes the best coffee(Claud W Dennis Coffee Bar) asked me to have a cooking class for his girlfriend’s birthday. Usually I have no day off as I am occupied with many cooking classes and catering (and gym!!?? if I am free). But there were a few days before the next month. He contacted me at just right time. As she doesn’t eat meat the class has to be a kind of vegetarian. I am very happy to arrange for it. After some exchange text with him because of a surprise gift for her, we finally decided the menu. As they are good with hands they have no problems to make sushi and wrapping gyoza. They enjoyed cooking. Well done both of you!! They took many pictures including me. I was planning to taste at the kitchen then I move to eat properly at the dinning as usual but we didn’t have enough time. I wish I didn’t have to pick up Kai today, sorry. I had to ask them to drop off to the school finally. I really enjoyed the class until the last minutes. I had a wonderful time to share with them. Thank you for remembering my cooking class. Happy early birthday, E and hope to see you soon, F.
This is a birthday present from my friend to her mother in law. She invited her two friends. Such nice and friendly ladies. Full of talks and laughs. They are not so familiar with Japanese food. So They asked me a lot of questions and so messy with Japanese rice. But they seemed to satisfied the cooking. I totally enjoyed this class today. Thank you so much to have wonderful time with me. My friend’s husband came to my cookery class today. He was very keen to learn cooking and he took notes a lot. In the kitchen we talked a lot about of course Japanese food, Japanese restaurant especially Wagamama and food history. He knows about variety of topics so I felt like I was a student. I had a chance to learn how to start Wagamama and Scotish food. He seemed to enjoy the class and ate most of them. Actually he said he wanted to take away but they were tasty and he couldn’t resist. Thanks for coming. I hope he cooks Japanese food for his family soon. Teaching local people is OK for me but I need somebody to arrange it. Anyway, I had very nice people today. One is my friend from Kai’s ex-school. I am very pleased that we still keep in touch. The another is new comer. Once I met her I was sure we will be good friends. Kindly she brought lovely tulips. She heard about my class through Japanese friend. Thanks for recommending my class. We are all working mums. We are living in North London. Our kids are playing violin. They love Japanese food of course and interested in Japanese culture as well. During cooking in the kitchen they asked me about food and ingredients a lot with taking pictures. We cannot stop talking about school, education, music and nationality. I felt we are old friends and having lunch together. Organising local class is tough job for me but it is worth to try. I feel good after the teaching always. This is I should carry on, no matter how small class is. Many thanks for coming today. I had a great time. Hope to see them next month for sushi class. It was the first time “Tempura” to teach local cookery class. One of the local people was keen to learn Tempura. When I was about to arrange the class I was not sure if I can have the class. One from Kai’s class mate mum then two boys meant to come here today. His mum is one of my Japanese customers But somehow his friend can not come and finally he took his mum. They are friendly. My kitchen was full of smile and tempura smell. When I have local class, I was thinking if I do casual style or proper Japanese style. Today I decided to go easy option, which means I used Japanese soup stock powder instead of Kombu kelp and bonito shavings for soup stock. Because most of them would be beginner and I want them to learn Japanese dish is easy and simple. Usually my class would be demonstrate style but today I demonstrated first them let them try later. We cooked Sunomono, boiled rice, miso soup and tempura. I hope they enjoyed the class. Thank you very much for coming my cookery class today. It was lovely summer day. I really had a wonderful time with you. 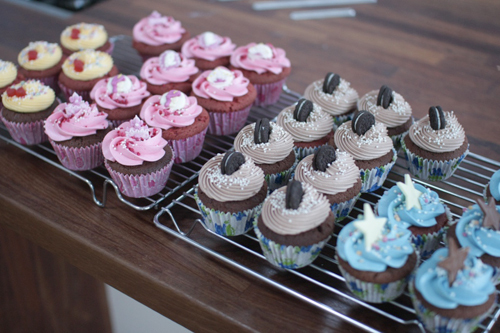 本日は225位。As soon as I finished the class I had to bake cupcakes for Summer Fair of Kai’s school tomorrow. I love cupcake with pastel colour but for local they prefer to bright and vivid. I tried to my best with incredible colour. Here they are!!! Not for me to eat though.